Showing for the first time at Printwear & Promotion LIVE! in January will be new HCR3-1504x Stretch. The HCR3-1504x has been created for those who need high production capability and a large sewing field. 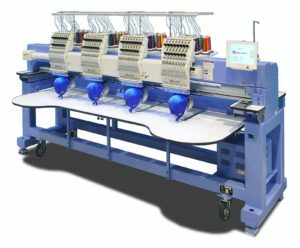 The sewing field for each of this machine’s four heads has been extended to allow embroidery on the included set of 17.25×16.5in hoops, making large projects such as team appliqué uniforms, full jacket backs, or even mass-production of patches possible, or much more efficient. The machine is still compatible with conventional field Happy hoops as well. The HCR3-1504x includes Happy’s latest multi-head technology such as servo drive for faster, quieter sewing, more robust construction for greater durability and more-consistent sewing quality on even the most challenging surfaces. 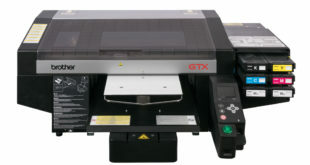 Servo drive system for quieter, higher speed operation. New carriage base design for smoother, steadier operation at all sewing speeds. User-friendly touch screen control with on-board help, auto-error correction. USB flash drive ports, LAN and USB PC connection ports, included software. 40 million stitch/ 999-design memory. Load and set up additional designs while the machine is sewing. Automatic color change. 250 changes are allowed per design, appliqué stop or frameout. Onboard edits: flip/rotate, fine-scaling, offset from centre, and more. Visitors to the exhibition will be able to see live demonstrations of this embroidery machine in action on Midwest Machinery’s stand.